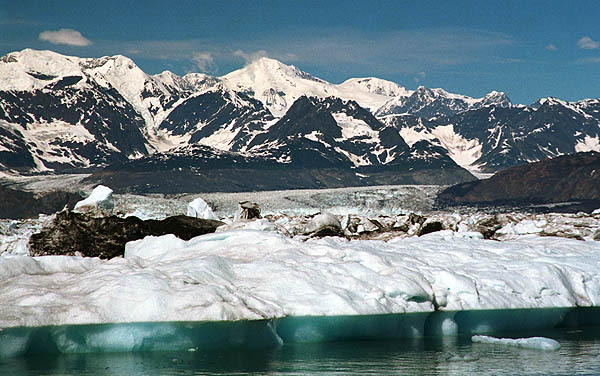 Next stop on the tour was the Columbia Glacier, Alaska's second largest tidewater glacier and one of the largest on the continent (it covered 440 square miles in 1997). We're actually two miles from the glacier face; the glacier slipped from its terminal moraine a few years ago and is now breaking up and receding rapidly because the face is exposed to water, accelerating the calving process. It's estimated to be losing 10-15 million tons of ice each day, but this means the sound nearby is filled with impressive icebergs!